I finally finshed this guy the other day. 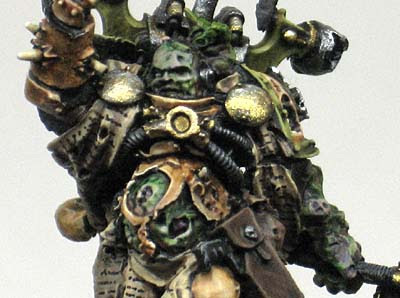 Lots of washes and layers to get a suitable grimy look but I think he came out alright in the end. I didn't realise just how much detail there was on this guy until I really got started on painting him. 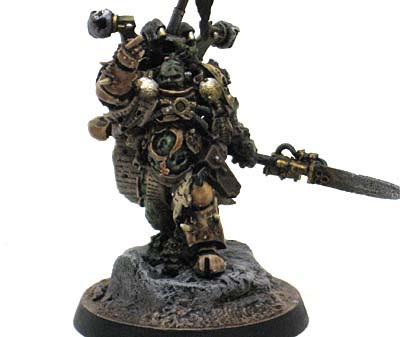 I had to take a look at the pictures of Forgeworld's finished version just to see how someone else went about blocking out all the colors. Looks awesome. It kind of looks like he's flippin' me off in that top picture. Great work! It can be difficult to do FW models justice but you've nailed this one. He looks suitably gross. Great work! Thanks guys, I'm hoping my friend likes it enough to send me more work. Always need to keep the clients happy. Cool model, and great job. Well done. is the lack of focus. My eyes don't really know where to look. so that it really stands out. nOObyfied: You bring up a good point. In real life there is a bit more contrast to the chest and head but going back now and looking at it, I might have done better to push that a little more to draw the viewers eye.